Jenny and I met up with Scott LaMorte at MacWorld last week for about an hour. 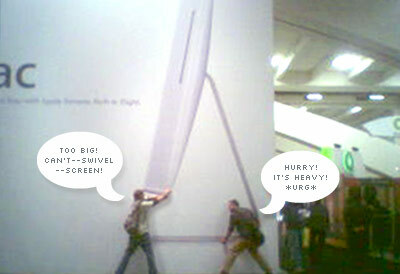 Scott and I checked out the new 20-foot iMacs. Those screens just keep getting bigger and bigger! "Dweebs"? Pretty funny coming form the girl who took the photo. On her camera phone. ?For a long time I have had the idea that Apple is not really a successful computer company, but rather, it's a successful marketing company. Apple is like the folks over at the Intelligent Design headquarters -- they know that in reality 97 percent of the world could care less about what they have to offer, but they've managed to steer the debate in such a way as to seemingly APPEAR to be the other "half" of the argument no one is having. And that quasi-religious Macworld thing is just plain creepy. You don't see people swarming all over Moscone Center every time Braun introduces a new toothbrush. Oh yes they do? it's called Braun Welt!